Alamo Area Search and Rescue (AASAR) is an all volunteer search and rescue team based in the San Antonio, Texas area. Our volunteers provide search and rescue resources to public safety agencies in Texas free of charge. Our team currently consists of Wilderness Search Specialists and Search and Rescue Canines. Alamo Area Search and Rescue (AASAR) is committed to providing search and rescue resources of the highest quality to public safety agencies in Texas. Our responders are certified by national agencies and are committed to enhancing their skills through continuing education. All of our responders (human and canine) are certified by rigorous standards before they are deemed mission ready. If you are confronted with a situation involving a lost or missing person you should CONTACT LAW ENFORCEMENT IMMEDIATELY. The sooner a search is started the better the chance for survival. 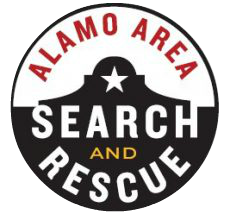 Alamo Area Search and Rescue will only respond to calls from law enforcement or the responsible local, state or federal agency. With approval from the responsible agency, Alamo Area Search and Rescue will assist other search organizations.